Voting is our Right and we all should vote for the right candidate. The mark on the finger after voting is so satisfactory that it can not be explained in words. We feel immense joy that we are the citizen of Republic of India. Many a times voters fell in dilemma when they do not find a proper candidate in the election fray. The candidates may not be of their choice due to various reasons. it’s a situation the voter has to handle themselves. In that case voters should not give away their voting rights but instead record this. In this way their vote(s) are not wasted but registered. Rule 49-0 of the Conduct of Election Rules 1961 of India which governs elections in India has that provision. A valid voter whose name is in the voters list can avail this by registering an entry in Form 17-A from the Presiding Officer of the election booth, the form has also to be signed by the Presiding Officer of the concerned election booth. Although the result of this practice will not practically visible or effect as far as election result is concerned but it is a satisfaction for the voter that they have not wasted their voting right but at least registered a protest vote. The matter is pending with Election Commission of India to add rejection button in EVMs. It has to be watched when that dream will come true. 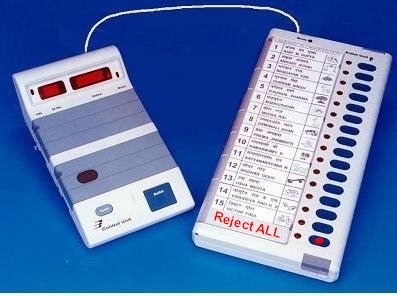 It can be argued that when there is a provision under Conduct of Election Rules 1961 then reject or not to vote button can be added in the EVMs. It will keep the voter’s detail secret which otherwise can not be kept secret when form 17-A is filled. Team Anna is also suggesting for addition of reject button. But till it is not there option is there to reject candidates by a voter.